So, Christmas time is coming closer, or maybe it's a birthday, and you want to give a telescope as a gift. You want to be sure that the telescope you buy is a nice one, and would like to see it get used on a regular interval. Buying a telescope can be an intimidating project. You'll hear about aperture, focal length, and different types of scopes. It doesn't have to be as difficult as it sounds, however. Follow these simple tips and explanations and you'll be sure to pick the right type of scope, at the right price for your budget. There are several features to look for when considering purchasing a telescope. These considerations include intended budget (versus the cost of the scope), aperture, focal ratio, accessories, and telescope type. Magnification is not as important as it sounds. Images are brighter and more contrast-y when not magnified as much. Some of my best views of planets and the moon are under 100x! Perhaps one of the most important aspects of giving a telescope as a gift is: How much are you going to spend? Do you have $200 to spend, or is your budget closer to $600 or more? Your budget will determine a lot about what type of scope you can give as a gift. A common misconception about astronomy is that it is an expensive hobby. One can now get a relatively large telescope and accessories for $350 from several major manufacturers. Aperture is a key characteristic of any telescope. It is defined as the diameter of the objective lens or mirror of the telescope, and is a direct indicator of how much light the telescope can gather. When it comes to aperture, bigger is better, and there certainly are some big telescopes out there. Some commercial scopes can be had in apertures above 16", some up to 30"! While bigger is better, how much is enough? The practical answer to this is that aperture is generally related to the price of the scope. Generally speaking, the bigger aperture you want, the more expensive the telescope will be. If you're looking at a Dobsonian telescope, which is going to be the cheapest per aperture, an 8" aperture is a great place to start. Most telescope manufacturer's offer 8" telescopes at very affordable prices. Focal ratio is another important aspect of a telescope, and is typically given as f/(some number). For example, my 10" Zhumell Dobsonian has a focal ratio of f/4.9. The lower this number, the "faster" the scope. Therefore, a telescope at f/5 is "faster" than a telescope at f/7. This is misleading, however, since faster is not necessarily better in a telescope. Faster telescopes tend to be more demanding of the quality of their eyepieces, so keep that in mind. Focal ratio is important because it relates what the scope can be used best for. Typically, fast focal ratio scopes are used for low-power, wide-field viewing of deep sky objects such as galaxies and nebulae. Slow focal ratio scopes are typically good at planetary and lunar observation. Knowing the interests of the intended observer can be helpful here. Both scopes can, however, be used for either purpose. A good focuser, such as a Crayford: This will keep the scope from wiggling too much during focusing. At least two eypieces: Eyepieces determine magnification, so you want some variety here. A good finderscope: Typically most of these packages come with a decent finder. If the scope is a fast reflector, you'll need collimation tools, at least to get you started. Then there's the question of what type of scope to get. Some of the major telescope types are the refractor, the Newtonian reflector, the Dobsonian reflector, and the compound scopes. 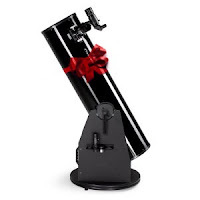 If the person you're buying the gift for is a beginner, I would suggest a Dobsonian type telescope (like the one pictured at the top of this page). They are easy to learn on, very inexpensive, and work very well with their large apertures. They are available with or without computerized object locators from several companies like Zhumell, Orion, and Meade. Leave a question below in the comment box and I'll personally answer them! Or send me an e-mail and I'll be sure to respond promptly. I agree with almost everything you posted, except for the "Packaged Deal" section. Let me explain. A RACI finderscope is fine, provided you have a unit finder like a telrad or quickfinder. Otherwise, they are a bear to get rough alinged and next to impossilbe to get pointed in the right direction. I much prefer a straight through finder and for a biginner, they are easier to figure out. Laser collimators can be just as big of a PITA as they can be a help - unless you have someone that knows how to collimate their collimator =-) For beginners starting out, a good cheshire or even those collimation caps that Orion gives away are easier to figure out and work just as well or even better in most scopes. If it is an F/7 or higher, then the collimation cap is super easy, cheap, and works every bit as well as a high end laser (Glatter-bug). Ahh, well stated RapidEye. Sometimes it takes a comment or two for me to realize some wording may have been odd! ;) I'm fixing a few sentences so it isn't misleading. Good advice! I always try to steer people away from anything sold at Wal-Mart, and instead hand them an extra Orion catalogue I have laying around. Although last year Wal-Mart was carrying one refractor from Meade (I believe) that became popular as a "big finder" for big scopes and also as a cheap grab-n-go. I'll wait for input from the astronomy forums first, though! One’s own blog post is amazingly remarkable and even insightful. My group is scheduling to settle on a profession relocate of which this contains given a hand to all of us through taking care of. At present follow-up check cashing Bless you individual!